Waterbury Clock Company hanging clock, "Balcony", C. 1915. The old oak case is 26" across the back, made up of 4 layers of oak, each layer bonded together in sections. On the bottom the pieces are 10", second section 9", etc. The case with all its sections is big big. The top two sections lift up to access the dial, pendulum, and hands. It is hinged at the top. There are labels on the back that simply call the clock, "Inch Gallery". The very nice metal dial is 18", and takes an 8 day, time only movement. The movement is missing. You will note that the wind arbor is directly below the hand arbor and center to center is 1.75". 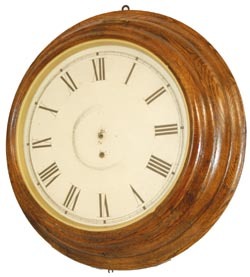 You will also need a pendulum and hands to complete this valuable gallery clock Ly-Waterbury #656.